From deep in the foothills of Mount Kilimanjaro in Tanzania comes tanzanite, one of the most intriguing and desirable precious gemstones of modern times. Exceptionally brilliant, tanzanite is unique among gemstones for its multi-dimensional color, radiating a dazzling kaleidoscope of royal Blue, violet, indigo, lilac and periwinkle. 1000 times rarer than diamonds, tanzanite has enchanted discerning jewelry buyers seeking rarity and distinction. Yet it is also a gemstone with a unique heritage, with multi-layered depths, with meaning, capturing the imaginations of today's consumers as they focus more and more on the history of gemstones, their symbolism, and their inner life of soul. Tanzanite's heritage is a story underpinned by an age-old Maasai affinity with color Blue, regarded as sacred, healing and above all representative of new life. Modern Maasai legend has turned tanzanite into the gemstone celebrating the gift of birth and new beginnings. And with a new universal conscience moving ethical considerations to the forefront of consumer's minds, partners in the tanzanite industry are leading the world in ethical mining and fair trade initiatives. Add to this the investment in Maasai community upliftment projects championed by the non-profit Tanzanite Foundation, and you have a truly modern gemstone with a recipe for success. Tanzanite is a rare and precious gemstone with only a single known source in Tanzania, East Africa. It was formed over 585 million years ago during the Pan-African event, when the continents collided, yet it was only discovered by man in 1967. Tanzanite’s geology is so unique that the chance of tanzanite occurring elsewhere has been described by experts as being ‘one in a million’. Tanzanite’s supply is limited to a single generation. This unparalleled rarity has earned tanzanite its own unique place in the gemstone hierarchy. The historical two-way split between diamonds and colored gemstones has now evolved into three categories: diamonds, colored gemstones and tanzanite, which stands apart due to its uniqueness. Tanzanite’s color, poised intriguingly between Blue and violet is unlike that of any other gemstone. It is this unique color, vibrant, individual and youthful, that gives tanzanite a strong, immediately recognizable identity and contributes to its special positioning in both the gemstone and the fine jewelry markets. Tanzania is endowed with a rich and intriguing folklore. From the time of tanzanite’s discovery, local Maasai communities have built their own legends about the origins of this extraordinary gem. They believe that the land was set ablaze by a bolt of lightning, with the heat from ‘the magic fire from the sky’ transforming crystals on the ground into shimmering Blue-violet stones. When the last cinders dissolved into the earth and the thick smoke settled, awestruck Maasai tribesman filled their pouches with the mystical gems, intuitively knowing that these jewels would bring about a better life. Tanzanite’s actual discovery remains somewhat a mystery. Although these are various versions, it is not known for certain who actually discovered tanzanite. The most widely accredited narrative suggests that in July of 1967, an indigenous pastoralist and tribesman named Ali Juuyawatu discovered a piece of translucent crystal near Mount Kilimanjaro. Fascinated by its color, Juuyawatu shared his find with Manuel D’Souza, a tailor by profession and prospector by passion, who was looking for rubies in the region. Believing the find to be a ‘vibrant sapphire’, D’Souza did not realize that he had stumbled on an entirely new specimen. Gemological tests soon revealed that the crystal had a composition more complex than sapphire and a color that was more intriguing, more alluring and totally unexpected. Celebrated New York jewelers, Tiffany & Co., gemological pioneers since the late 19th Century, heard about the remarkable discovery in Tanzania. At that time, Henry B Platt, great grandson of Louis Comfort Tiffany, and later president and chairman, was working with Tiffany’s then president, Walter Hoving, shaping and directing jewelry collections. It was Platt who first seized upon and marketed the new gemstone, naming it ‘tanzanite’ after its country of origin, and launching it at Tiffany’s in October 1968. He remarked that it was undoubtedly ‘the most beautiful Blue stone to be discovered in over 2000 years’. Tiffany’s initiated the first tanzanite advertising campaign which focused on tanzanite being found in only two place in the world, ‘Tanzania and Tiffany’s. The Tanzanite Foundation is a non-profit, industry-supported organization dedicated to safeguarding and promoting tanzanite. The Tanzanite Foundation was founded in 2003 to stimulate the growth and development of the tanzanite industry, while creating value for ethically operating and socially conscious industry stakeholders. The organization is committed to developing, maintaining and communicating confidence in tanzanite’s integrity and gaining stakeholder co-operation in the formalization of an ethical, dynamic tanzanite industry that all stakeholders are proud to be a part of. The Mark of Rarity is the icon of the Tanzanite Foundation and is a consumer’s guarantee of the rarity and distinction of their tanzanite purchase. 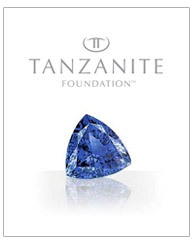 The Tanzanite Foundation strives to uphold an ethical route to market in accordance with the Tanzanite Tucson Protocols, and invests in meaningful and sustainable upliftment projects developed in harmony with indigenous communities in Tanzania. Tanzanite, the birthstone , is the gift given on the birth of a child. Fittingly this theme draws on the inspiration that we are all born to something special. The promise of a person begins with the earliest moments of life and every tradition cherishes and celebrates a child being born, the miracle of birth, and the gift of life. From the heart of Africa comes a powerful tradition. Maasai women who have had the honor of giving birth to a child wear Blue beads and fabrics to bestow upon the child a healthy and positive life, whilst setting themselves apart as creators of new life. This custom, protected and preserved by the proud Maasai over generations, is now embodied in the unique color of a mystical gem, tanzanite. Great Maasai chiefs give tanzanite to their wives on the event of a birth, marking the occasion and blessing their baby with luck. Found only at the foothills of Mount Kilimanjaro, tanzanite’s kaleidoscope of Blue-violet colors draws on the mysterious beauty of its place of origin. The gift of tanzanite at birth uniquely symbolizes new beginnings and pays tribute to those who have shown the greatest of loves by becoming a parent. Besides being recognizes as the birthstone, tanzanite will, because of it’s limited availability, become the gemstone of just one generation, adding to it’s appeal as an heirloom, to be handed down to future generations. • Tanzanite Foundation Community Development Projects. The Tanzanite Foundation is committed to making a real difference to the lives of communities at tanzanite’s source by contributing to social and economic upliftment projects. The Tanzanite Foundation empowers indigenous communities to improve their way of life. This principle is based on the belief that through stimulating demand for tanzanite, sustaining the industry’s economic viability and most importantly channeling revenues back up the value chain to the source, both Tanzanian communities and the country’s economic will derive significant benefit. Tanzanite Foundation Members undertake to operate in accordance with legal and ethical employment practices and adhere to strict safety standards across the board, the Tanzanite Foundation has developed the Small Mines Assistance Program (SMAP). SMAP aims to build relations with small mines in the area by facilitating the transfer of geological, mining and safety guidance as well as providing crisis management assistance. The Tanzanite Foundation has made significant investment into grass roots infrastructure programs, creating an environment in which communities can grow and develop in a self-sustaining manner. Equipped with persistence and resourcefulness, the Maasai people continue to practice their ancient rituals and ceremonies, even in the face of adversities such as drought. For these tall, proud, nomadic people, cattle are sacred, and they work hard to protect them. In an effort to assist the resulting plight of the communities in this area, the Tanzanite Foundation has been providing water to approximately 2,000 villagers and 4,500 heads of cattle daily. The Tanzanite Foundation has refurbished and expanded the Nasinyai Primary School, which is located in the village adjacent to the tanzanite mining area and educates 420 children. With the help of the Tanzanite Foundation, a secondary school and staff accommodation facilities have been constructed. The Tanzanite Foundation renovated and installed electricity in a medi-clinic in the rural region – an essential resource in the area which the Tanzanite Foundation continues to support. The Tanzanite Foundation has also constructed a Community Centre for the residents of Nasinyai.The Community Centre, used for social gatherings, community congregations and church meetings for local residents, is a valued community asset. The Tanzanite Foundation is also committed to the protection and rehabilitation of the mining area environment, initiating the clearing and recycling of scrap materials and debris discarded by previous miners, and encouraging wildlife and prolific birdlife back into the area. To hope . To dream. To give . To be bright born . To dazzle . To astound. To learn . To be transformed . To grow . To succeed . To acquire . To be perfect. To pioneer . To laugh . To surprise. To be abundant . To aspire . To achieve. To champion . To be free . To love . To celebrate. To be treasured . TO BE BORN TO TANZANITE.